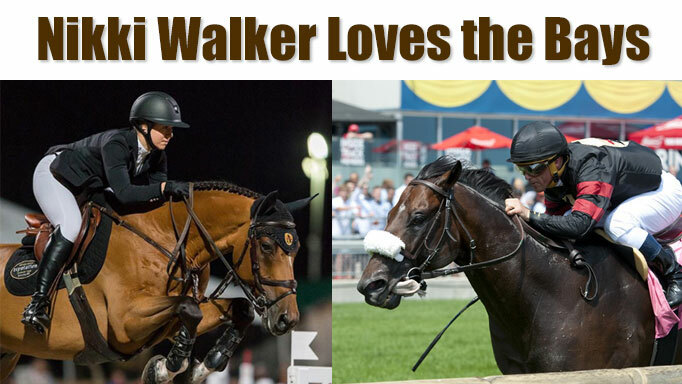 Nicole Walker inherited the horse gene from her grandfather. Nicole Walker pictured on Excellent B (Ben Radvanyi Photo) will be cheering for Stronach Stables’ Delta Prince in the Richol Woodbine Mile (Michael Burns Photo). Like most horse-smitten young girls, Nicole (Nikki) Walker used to favour splashy colours such as dapple greys and palominos. But when she asked her grandpa what colour he preferred, she was surprised to hear he had a thing for plain bays. 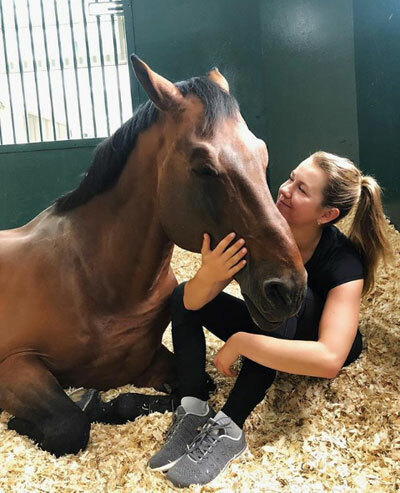 “I never understood it as a child,” says Nicole, 24, who is a rising star on the grand prix show jumping circuit, both in Canada and internationally. 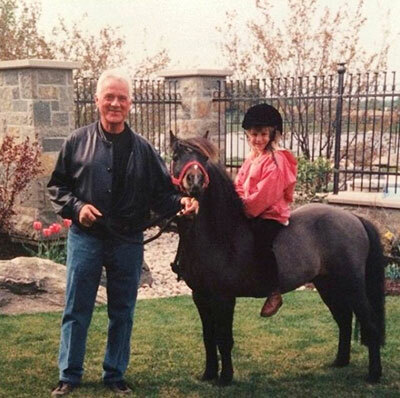 Her grandpa is none other than Frank Stronach, the Austrian/Canadian founder of auto-parts giant Magna International and the Stronach Group, North America’s largest consortium of various horse racing, entertainment and pari-mutual wagering interests. These days, Nicole is embracing her grandpa’s penchant for the coat colour. The top horses in her jumper string are all bays: the stallions Falco Van Spieveld, a 13-year-old Belgian Warmblood, and 14-year-old Westfalian Deko De Landetta Z, plus the gelding, nine-year-old Dutch Warmblood Excellent B.
Frank Stronach and Nicole Walker on Misty Joe. Nicole certainly comes by her enthusiasm for horses naturally. “It started with a bond between me and my grandpa. 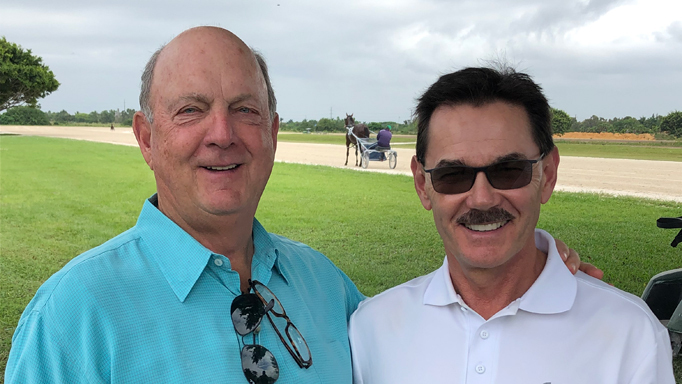 He would take me out on ponies around the farm,” says Nicole, referring to Adena Springs in Aurora, ON, one of three Stronach Group Thoroughbred breeding and training operations that also includes farms in Kentucky and Florida. Here, she recalls riding her first pony, a little bay named Gus who delivered an attitude typical of short-statured equines. Nicole was around eight years old when she started riding lessons at Barb and J.T. Mitchell’s Cornerstone Farms. She competed on the Ontario Trillium and A circuits, with early triumphs in the equitation ring, including wins in both the 2010 Jump Canada Medal and the 2011 CET Medal at the Royal Winter Fair Horse Show in Toronto. As her passion for show jumping burgeoned, Nicole began competing in Wellington, Florida, during the winters and spent summers touring the European show scene with her current trainer Irish Olympian Cian O’Conner. Now based out of Adena Springs in Aurora, she cites her most significant accomplishments to date as last year’s win aboard Falco in the $100,000 Prix de Penn National Grand Prix 3* in Harrisburg, Pennsylvania, and a victory in the Under-25 Jumping National Championship at the Royal on Excellent B. Meanwhile, Nicole isn’t the only up-and-comer in the Stronach camp who’s worth watching. The five-year-old homebred stallion Delta Prince who is – you guessed it – a bay, is set to run the $800,000 Woodbine Mile on September 15th at Toronto’s Woodbine Racetrack. “He’s a beautiful-looking horse by Street Cry out of a mare called Delta Princess,” says Mike Doyle, Stronach’s racing manager. Stronach’s Delta Princess, by 1992 American Horse of the Year A.P. Indy, was also dam to three-time Eclipse Award-winner, Royal Delta, who sold in a dispersal at the 2011 Keeneland November sale for $8.5 million – which, at that point, was the sale’s third highest price for a broodmare or racing prospect. She died last year at age nine due to foaling complications. The Woodbine Mile is a one-mile grade-1 turf race for three-year-olds and up. It’s a “win and you’re in,” meaning the victor procures an automatic berth in the 2019 Breeders’ Cup, which will return for a record-breaking 10th time to the Stronach Group’s own Santa Anita Park in California. “So, it’s an important event for a horse,” Mike says. Nikki relaxing with Deko De Landetta Z. Trained by James A. Jerkins, Delta Prince has four wins, three seconds and two thirds in a mere nine career starts. And the stallion’s results so far this year bode well for his Woodbine Mile appearance. 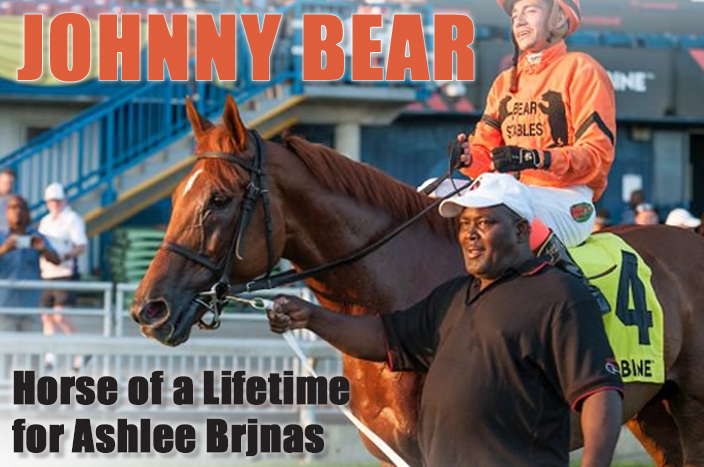 After a 10-month layoff, he came back June 30th to win Woodbine’s grade-2, turf race, the King Edward Stakes, in a blazing time of 1:32.45, not far off the track record of 1:31.75 set by two-time Woodbine Mile winner Wise Dan in 2013. And while Delta Prince has been making a mark on the track with top-three placings every time he’s raced, Nicole, too, has begun establishing herself on the Thoroughbred side of things. 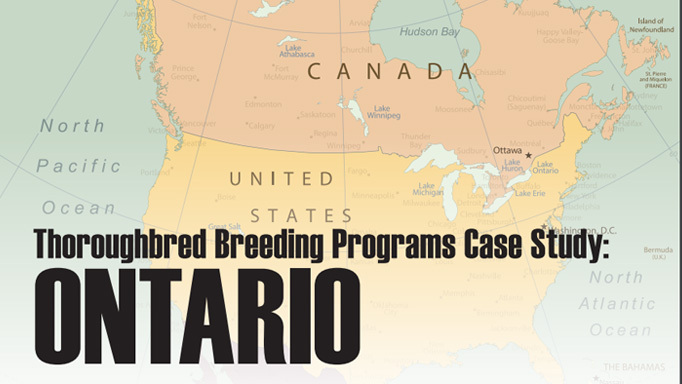 She’s actively involved in the Stronach Group’s in-house Adena Springs Thoroughbred Retirement Program, based out of the Aurora farm, which has found quality homes for more than 100 of their ex-racehorses. She is also a member of the Kentucky-based Thoroughbred Aftercare Alliance’s board of directors. Calling her duties “a mixed bag,” Nicole explains her focus right now is primarily on event management, including the Preakness Stakes, held every May at the Stronach-owned Pimlico Race Course in Baltimore, Maryland, and the Pegasus World Cup Invitational – the richest thoroughbred horse race – which is about to enter its third year in January at Florida’s Gulfstream Park. As for riding, her “big goal” is to ride for Canada. Having been short listed to the jumping team this year, chances look good for the talented rider. And chances also look promising for Delta Prince to bring home a Woodbine Mile win next Saturday under jockey Javier Castellano who has piloted him in his last two races. Nicole, for one, will be watching to cheer on the bay stallion she met last year in Saratoga and whose career she’s been following. What does Mike think we can expect from the boy on race day as he vies against 20 other horses from North America, France, Great Britain, Ireland and Japan? 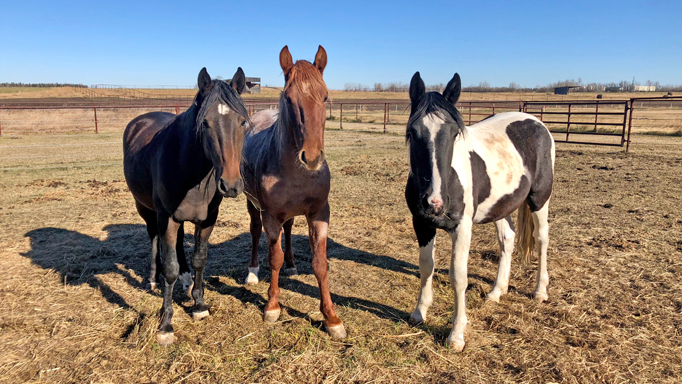 Three wild, young mustangs are taking horse trainer Robyn Szybunka back to school.